More videos! This one is about KARISMA erasable & washable pencils (available in the notions section of my Etsy shop). I’ll be talking about tools for the next few episodes, so let me know what you’d like me to cover. Our next show is the Seven Sisters quilt show hosted by the Associated Quilt Guilds of the Central Coast in San Luis Obispo, California. Leah and I did this show last year and were amazed by the quality of the quilts on display. Thomas will be joining me this year, and we’re looking forward to the road trip. Coming to AQS QuiltWeek in Grand Rapids, Michigan in August? I am! Catch up with the latest Japanese import fabrics and notions on the vendor floor, or come see vintage textiles from my personal collection. Register for my lecture From Country Cottons to City Silks – Vintage Japanese Textiles here. 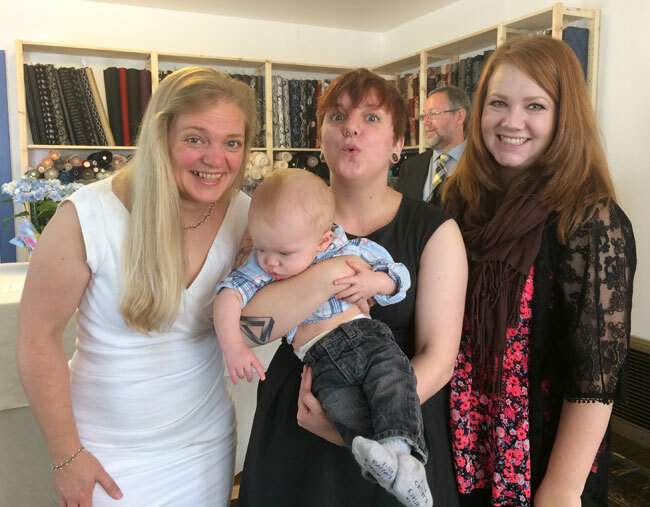 Oh, and by the way, Thomas and I got married a few days ago, right here in the shop! It was the only place in the house where we could fit everyone. See that baby? That’s Callan, my great-nephew. His mama, my niece Martha, is on the far right. The goofy (and somewhat adorable/weird/wild) child holding him is my daughter Mickey. Previous Post Show your work! CONGRATULATIONS TO YOU & THOMAS! GIVING THE EXPRESSION “TYING THE KNOT” A WHOLE NEW MEANING! LOL! Thank you, Helen! I hope we’ll see you here again soon, you’ll love the new space.